I loved to wander around the other departments on my breaks to see how the show was shaping up. In the Layout Department, Lorenzo Martinez led the background design team and created wonderful environments. I managed to hang onto two of his conceptual layouts, Castle Grayskull Interior and the Royal Palace of Eternia. I lost the Snake Mountain cutaway which annoys me no end. 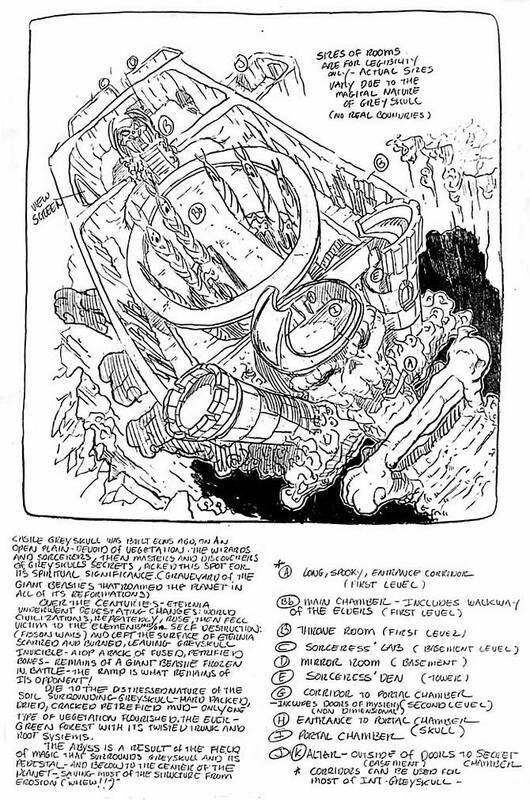 Castle Grayskull concept sketch – Copyright ©1983 Filmation Associates. 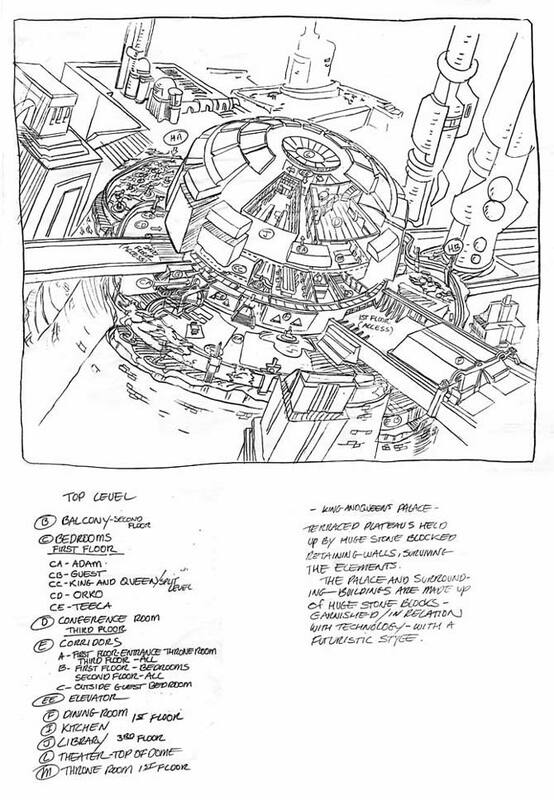 Eternia Royal Palace concept sketch – Copyright ©1983 Filmation Associates. There was a lot of creative thought behind the designs and not just interesting shapes. Lorenzo and his artists really cared about the mythology and alien culture and it showed in their work. I much prefer their designs for Eternia than the recent series makeover that ran on Cartoon Network. I haven't kept up with Lorenzo but I find his name on some fine feature credits, Dreamworks' "Prince of Egypt" comes to mind. I was not a painter then and background painting fascinated me. Every chance I could I would sneak downstairs to visit Annie Guenther, my favorite background artist. Annie started at Disney painting backgrounds for Sleeping Beauty in the 1950s and continued to work there into the seventies. All the background painters did amazing work, but Annie's work was always outstanding. It was thrilling to see what became of my storyboard thumbnails when the backgrounds were painted. I learned a lot by just watching her work. 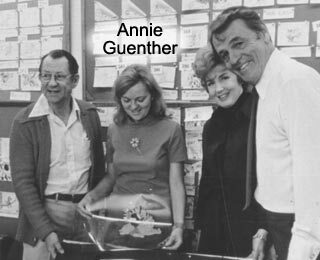 I wish I had a photo of Annie painting in the Filmation background department. 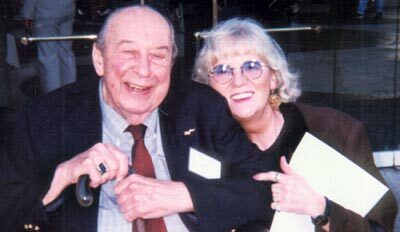 This photo is from an appearance with Disney animation legend Marc Davis at the Disneyland hotel in late 1999. He-Man and the Masters of the Universe turned American television animation upside-down. Before He-Man, animation had been consigned to the Saturday morning ghetto where it had been since the last primetime series left the evening lineup in the 1960s. Reruns of older shows got a second life on weekday afternoons, usually on local independent stations. All that changed with He-Man and the Masters of the Universe. The first season of He-Man and the Masters of the Universe utilized the same storyboard sheets we had used before: 9 panels on 8.5 x 11" minus the tv cutoff frame. With the complexity of an action adventure series the panel size made it difficult to stage some scenes. I made a larger panel template for such needs and would then reduce it and paste it into the board. In later series, starting with She-Ra, Princess of Power - Season 2, we used larger panels on legal size paper that helped a great deal. Other studios used the larger format because they shipped the boards overseas for animation and they had to include as much visual information as possible. But that first season was tough. Still we managed to work within the constraints. There are several good MOTU websites on the web but the two that I highly recommend are he-man.org and Busta-Toons’ He-Man and She-Ra blog. Check out the links below and see for yourself. They got a reprieve when it came to rendering the Crystal Sea in "Teela's Quest". The black line looked wrong on the crystals so they got to take the top cel off for those backgrounds. 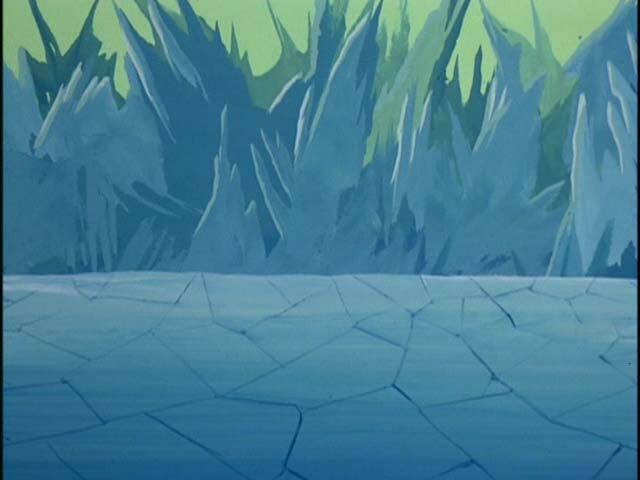 I reused the the crystal backgrounds for "The Dragon's Gift" since the formations looked very much like ice to me. The characters stood out from the paintings better than the inked backgrounds. 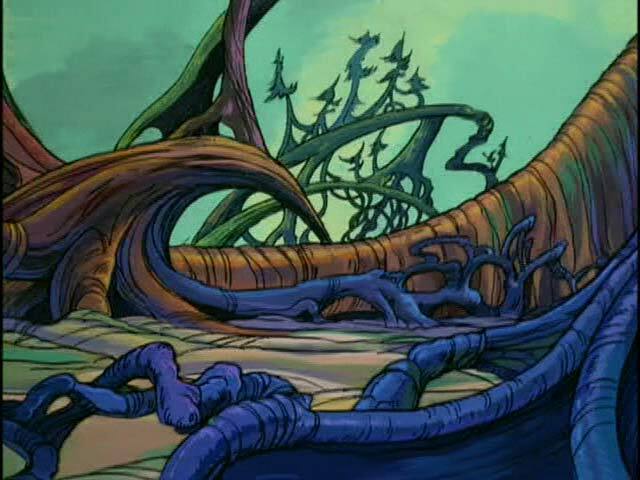 Eventually, in later productions, the background artists and others prevailed and the lines were eliminated in favor of fully rendered paintings. 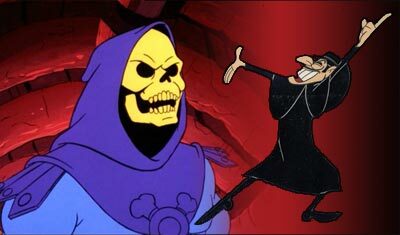 Filmation had a black line style to their backgrounds that facilitated production. A black pencil cleanup of the blue pencil layout would be xeroxed onto a cel that would lay over the painted bg. This eliminated the need for the painters to noodle a lot of detail into the paintings. Annie and other bg artists didn't like the ink line but production costs won out. 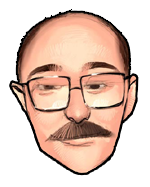 First run syndication was considered foolhardy because five times the number of shows would be needed for a season of 13 weeks, or 65 episodes. But Lou Scheimer and the Filmation bunch were just crazy enough to try it. After the famine of 1982, we needed to take the risk. Mattel chose Filmation to produce He-Man because of the strength of Blackstar in 1981. Lou Scheimer negotiated a good deal for the studio stating that Filmation would not tell Mattel how to make toys and Mattel should not tell Filmation how to tell stories. We would accomodate Mattel's wishes to include characters, props, vehicles, etc., as reasonable within any given story. This turned out to be a much better deal than Marvel struck with Hasbro for the GI JOE series. Hasbro had final script approval and insisted on maxxing out every scene with as much toy product as they could shoehorn into it. A friend of mine complained about a mandate that Joe and his gang had to use at least 3 vehicles to get from point A to point B no matter how close it was plus stage every character on camera in every shot possible. I don't know if that was an accurate description but it sure showed his frustration and the contrast between the two studios' agreements with each toy company. When I first heard about the He-Man series, I bought a couple of the DC comic books to practice drawing the characters. Though He-Man changed only slightly in Filmation's models, Teela changed quite a bit. The toy and the comic version had a cobra headpiece. I may be in the minority among MOTU fans but I prefer Filmation's version of Teela which, by the way, was based on Princess Aura from Filmation's Flash Gordon. Some of the storyboard guys, including me, didn't like the name He-Man at first. I have to explain this to younger fans who grew up with the character and don't understand why. Before Mattel introduced the toy line, the term he-man had taken on either a sexual meaning (“Hubba! Hubba! What a he-man!”) or a negative sexist meaning (“What a hyper-macho, knuckle-dragging, he-man jerk!”) It was embarrassing for a while to tell friends the name of the show I worked on. After it became a big hit, the term was recast as the name of millions of kids’ favorite hero and the issue never came up again. Another thing we didn't like at first was Alan Oppenheimer's interpretation of Skeletor. Instead of a menacing Darth Vader-esque baritone but got a nasally tenor. Over time we adjusted and came to love Skeletor's voice. I thought he sounded a little like Dishonest John from the old Bob Clampett Beany and Cecil show. Yeah, I'm that old.